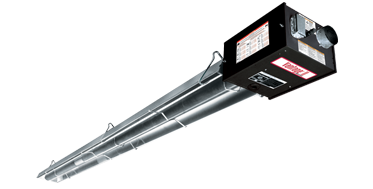 An infrared heater with a reputation, Vantage® II unitary infrared heaters have been around for over 40 years. With many older heaters still in operation today, it has been proven that quality products provide reliable, long-lasting equipment performance. Additionally, setting Roberts Gordon® apart from all others, a three year limited warranty is included with Vantage® II heaters and all available low intensity infrared heaters. Standard heater design includes Honeywell® SmartValve® II controller with gas ignition safety features. The valve controls gas flow, ignition and combustion air blower with assistance of a burner box mounted pressure switch. Inside the heater burner box, electrical components are partitioned from burner components resulting in longer life of individual components. LED diagnostics allow for ease of maintenance during heater troubleshooting.